t says: Those who have read our blog know that we love Mercato. As far as Italian BYO’s go, it’s up there with Modo Mio, Monsu, and Melograno. But now, let’s just say that it made a play for the #1 spot in our hearts. 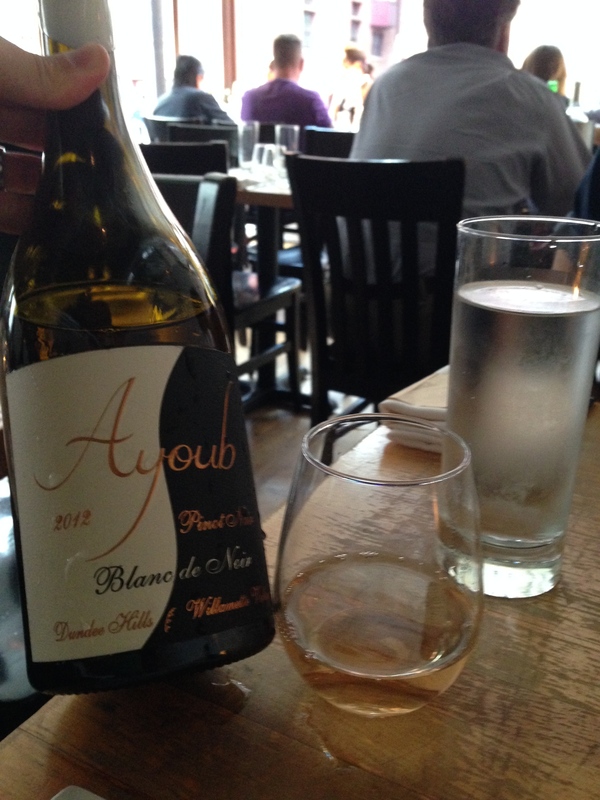 We pulled out this special bottle of Blanc de Noir, courtesy of Ayoub. An orange color, it had this interesting mix of vanilla and apple pie up front, with a thunderous lemony, chalky snap. It was a refreshing way to cleanse the palate between each delicious bite that was to follow. If you go to Mercato, you have to get the antipasti. 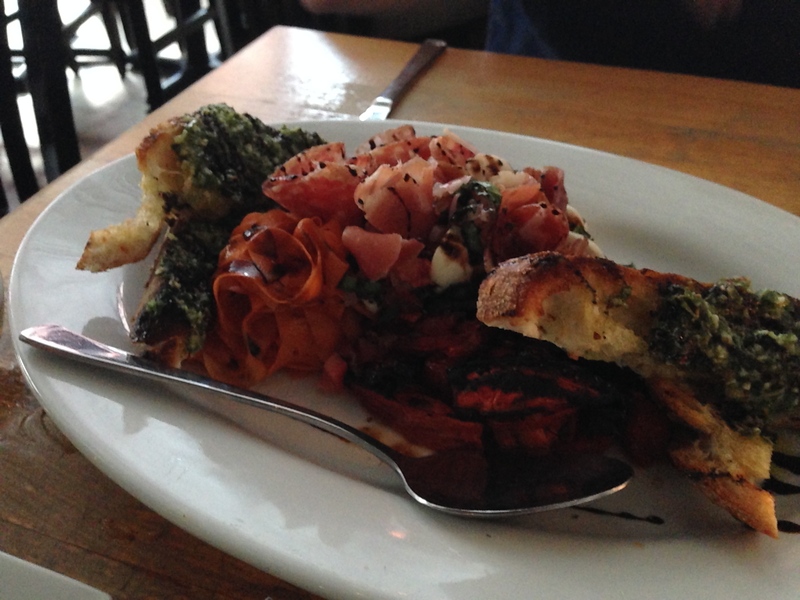 Made to share, this dish featured meats, pickled items, and pesto brushetta that I would have kept eating and eating and eating had there been more. Yes, it’s pricey, at nearly $20, but between two people it’s worth it. 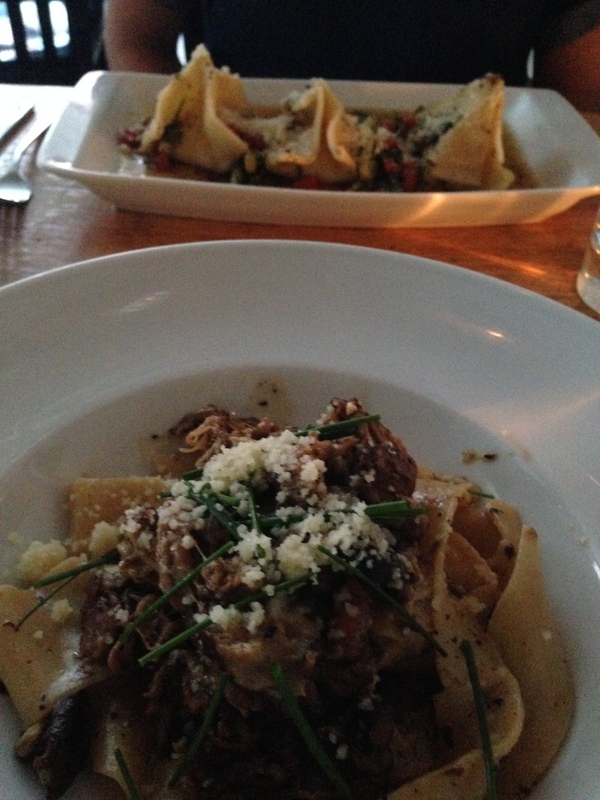 g went pyramid pasta – an item which she has had before that was still every bit as delicious as it was. But mine. Oh mine. It was a roasted suckling pig and mushroom papperdelle that is most definitely the best dish that I have ever had at Mercato. Some of Mercato’s pastas can be kind of wimpy. The sauces can be a little thin, with not a lot of meat shreds. Not so with this one, where the meat helping was bountiful and had this intriguing mix of pork and herbs. And I’ve had issues with some of Mercato’s noodles being flimsy – but not this one – the papparedelle had a hearty bite that sticks to your ribs. I loved every bite. Now if only it wasn’t a “special”, and was on the daily menu. We were too full for dessert, but were so happy we didn’t care. We stumbled home smiles on our faces. Thanks Mercato!